Historic RARE certificate #26 from the Boston Base Ball Association issued in 1872. This historic document and has an ornate border around it and is signed by the team's President and founder ( Ivers W. Adams ) and Treasuer ( H. Gardner ). This is one of the earliest Professional Baseball teams. Left margin cut into border, light folds in thirds with light toning on bottom, otherwise EF. The certificate was issued to G. Foster White for five shares of stock. This is on the second time we have had a certificate from the Boston Base Ball Association. 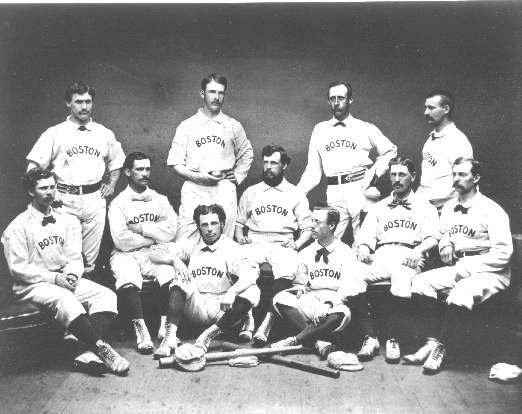 Established on January 20, 1871, the Boston Red Stockings was one of the eight original members of the National League. The team was orgnized as the Boston Base Ball Club with $15,000 in common stock at $100 a share. They won six of the first eight pennants and in 1875 they won twenty-six games in a row along with every single home game at the Union Baseball Grounds in South Boston. In 1883, in order to tie their identity to Boston and to avoid confusion with the Cincinnati Reds of the American League, the Red Stockings change their name to the Beaneaters. By 1912 the Boston began to be called the Braves. Ivers W. Adams was the founder and first president of the Boston Base Ball Club but only remained in the position for a year. Adams' bringing baseball to Boston was contingent on signing Harry and George Wright from Cincinnati. Adams thought the Wright's were upstanding gentlemen, and therefore, the right men to represent Boston in baseball.